Here you will find the archive for the building of the Zmod modules. New projects use this sites new blog posts feature. A long time with no action, but tonight a took some images on the module, with my new GP-35 and GS4. 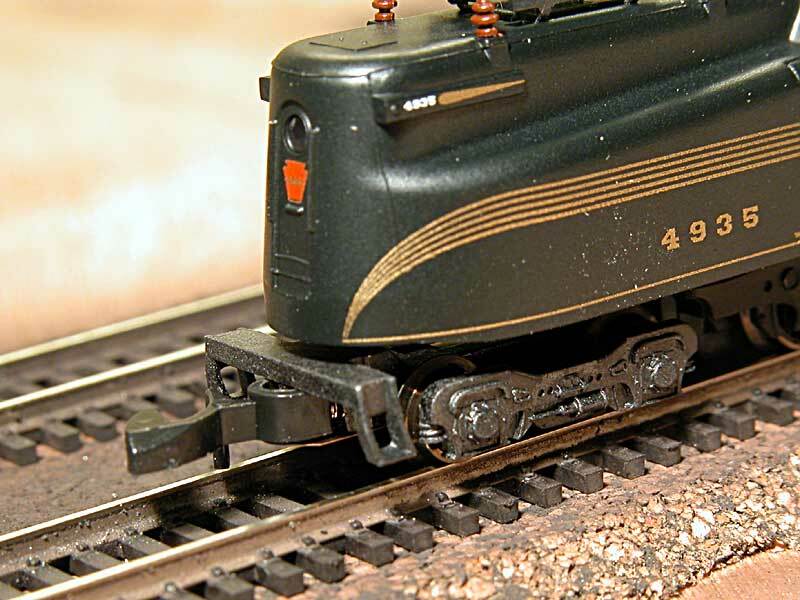 It's only the electrical connections that need to be installed before train can run on the module. 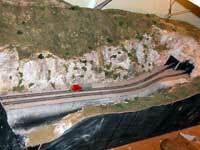 So it will be taken out of the road in this unfinished stage. 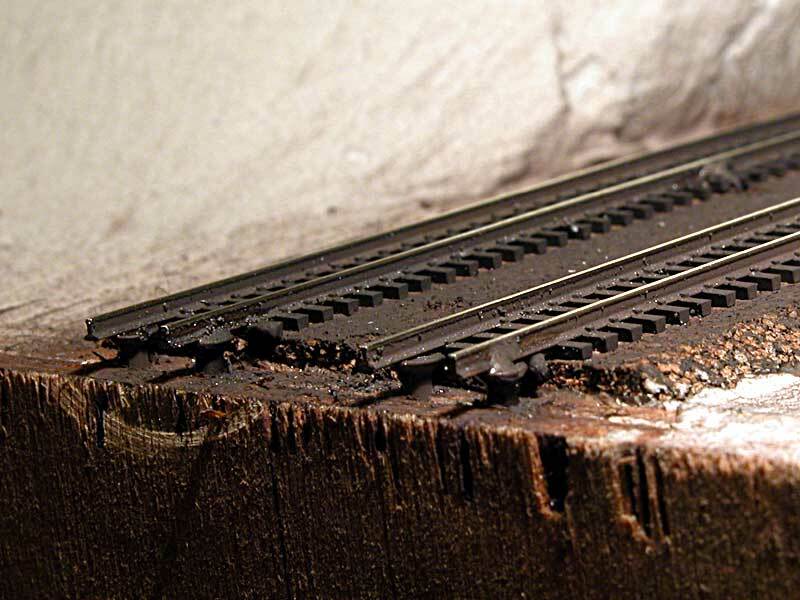 Ballasting of the track is finished. Only some cleaning and weatering need to be done. The rocks have got color and a lot of the landscape are close to finish. The roadcrossong is under construction, with the road and the different buldings. 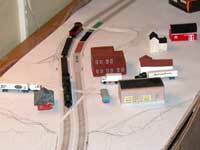 Many options here, but I think I will have a farm with some horses and a few other buildings around the crossing. 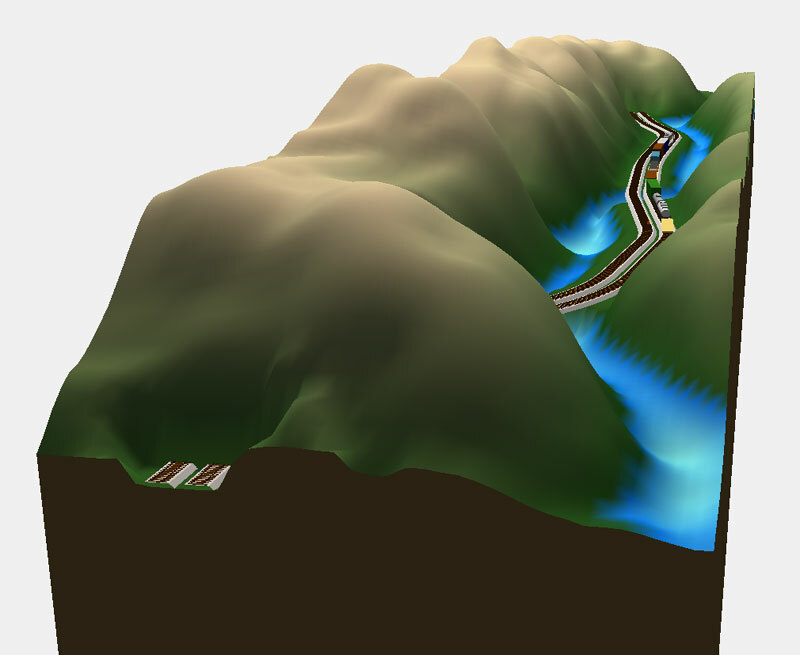 The river still need coloring, some rocks and "water". 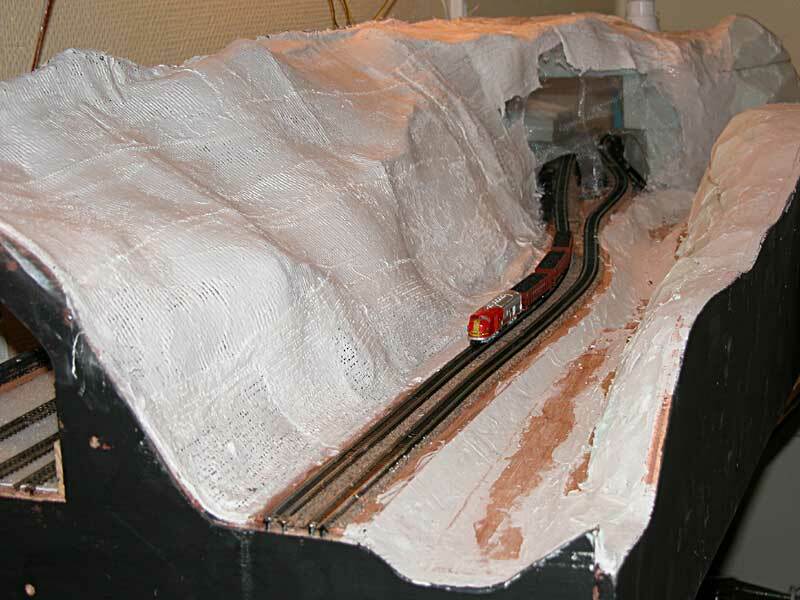 Today some pieces of rock molded in plaster are installed beside the track to form the sides. Some pieces have been colored before. 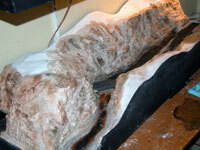 All the pieces are blended into the surface using plaster. Next step will be coloring. 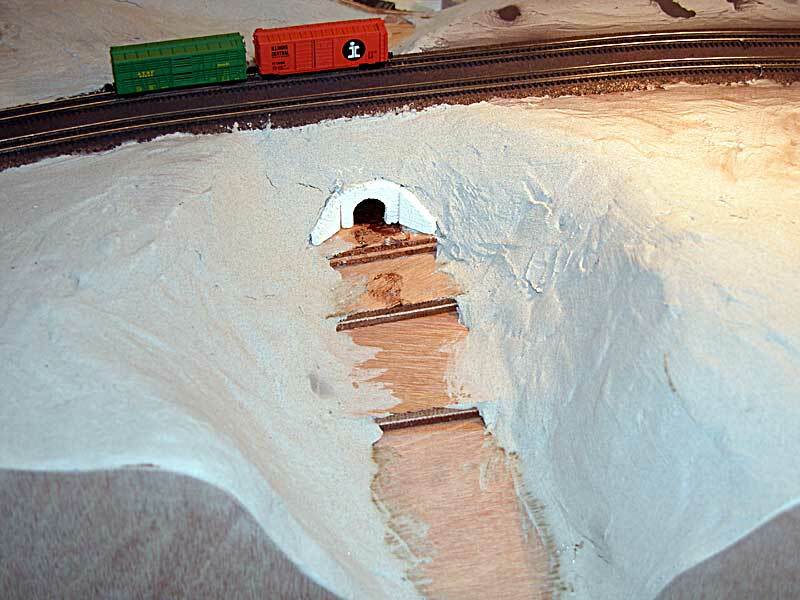 Today a culvert is installed under the track. 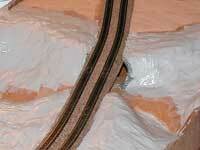 In the early plans a bridge should be used, but I had this Woddland Scenics culvert i N-scale already. I think that will fit my modul. 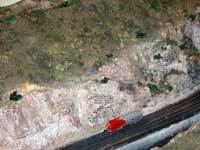 The riverbed and the different levels can be seen, created with pieces of plywood. 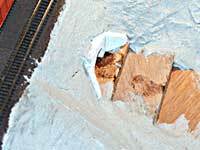 Today 2 operations have been executed: The cutting and fastering of the track on each end of the module. The tracks are soldered to small screws and the powercables have also been installed. 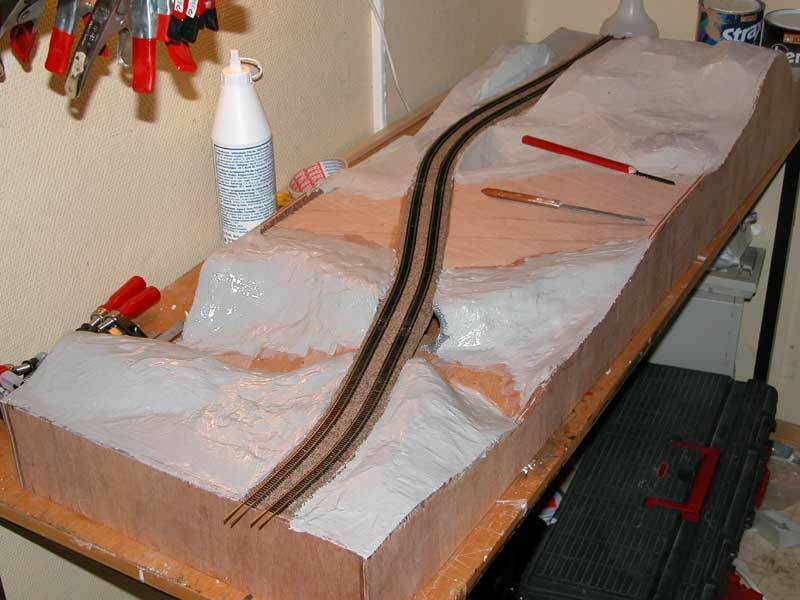 Another major activity done today are the painting of the tracks, using an airbrush. 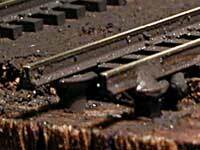 Humbrol Track Rust color from each side and flat black from topside, to darken the sleepers, gives a good result. That can bee seen in the right picture where you also can see the last jewel I have got, the PRR GG-1 electrical loco from Märklin. Slow progress last weeks, but finally I have continued with some landscaping. The basement for the river is installed tonight, the wire for the landscape is installed and the first layer covering the landscape. This time I want to use wire instead of foam for the landscaping. 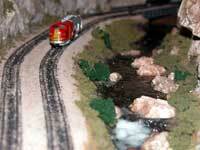 Next step will be to install the culvert where the track crossing over the small river. A lot of work have been done the last week. 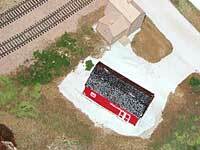 The tracks have been installed today and the landscaping have just started. 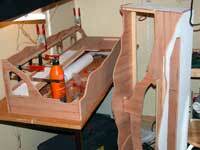 The construction of the new module started this weekend and the woodwork is now close to be finished. At left picture an early stage in the construction can be seen. 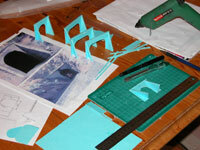 On the right picture, a 1:1 drawing of the layout is placed on top of the module. 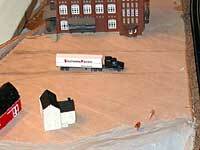 Some trains, buildings and cars are installed to test the scene. 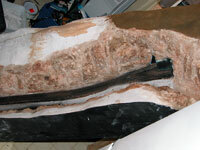 I think this will be fine, so the contruction will go on using the initial plans. A new module has been created and is under construction. 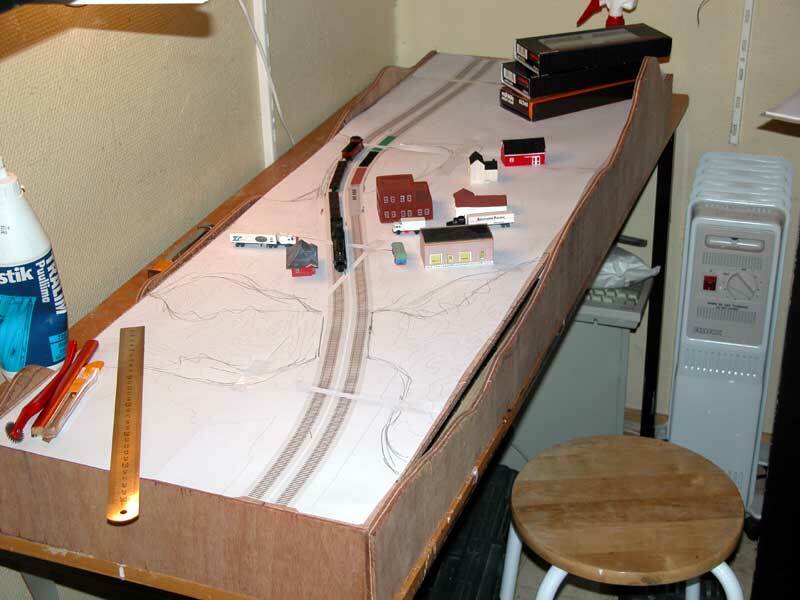 It will be a small 120 cm long module, with a scene where the highway is crossing the tracks in a small town, with some houses and little action. Stay tuned for the development of this module. 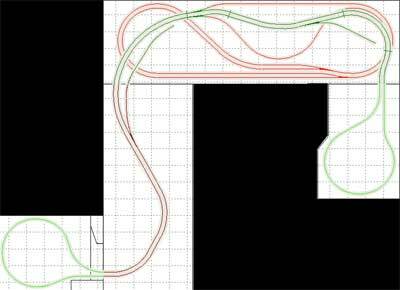 Here is the plan for this new module created using 3rd PlanIt. 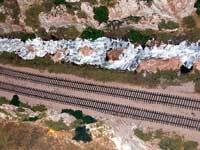 You can see the footprints of some buldings and the road crossing the track. May be some townbuildings, a gasoline station and a farm can be developed here on this land. 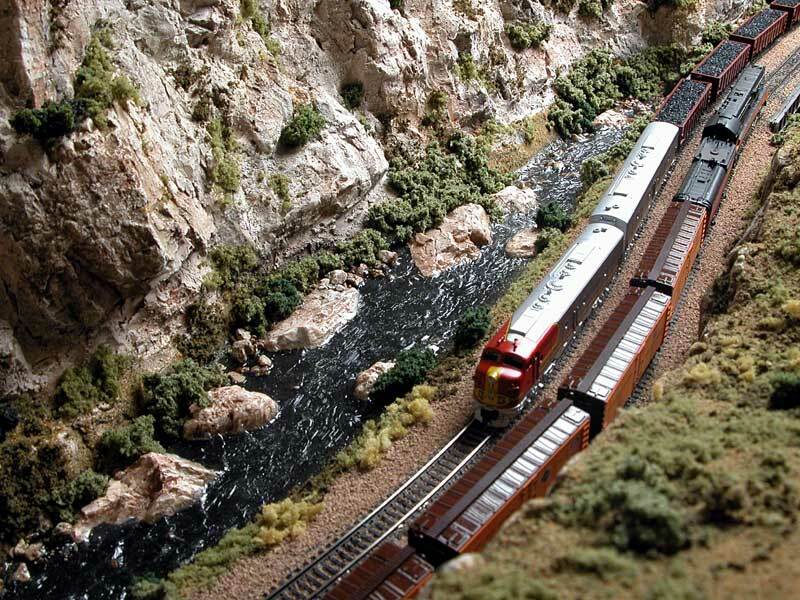 A bridge need to be installed where the track cross over a small river and the track creates a small valley on the other end of the module. 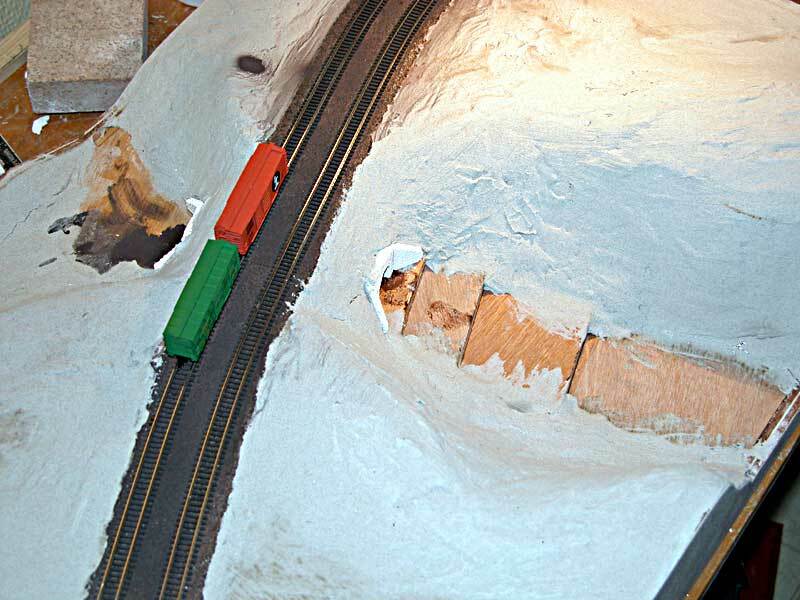 The tracks are going over to the other side of this module, so it can be used to switch side on the modules, so the back side will be the front side and front be back. New modules must be made, to make som more action. One easy way, is to make endmodules and small stright modules to connect together, behind the main modules. Some examples of configurations shown in the sketch. May be this can be build soon? Who knows. I have some days off during Christmas time. 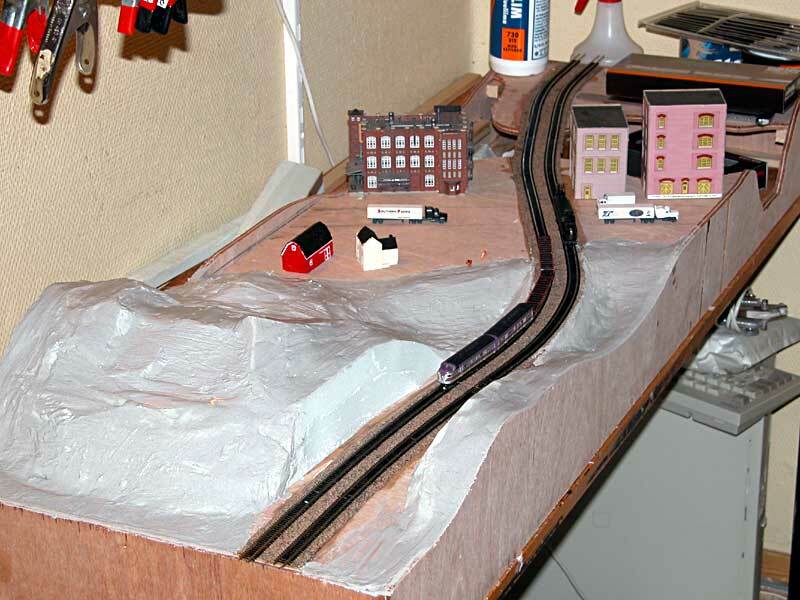 I have started other layouts in that time before, so may be this year also?. It has been a long time with no new pictures, so I guess it's time to show the current situation on the module. Only a few minor things remain to be done. Watch the action in the valley on this pictures. The GS4 Daylight with the fruit cars is meeting the E8 A+B with coal. 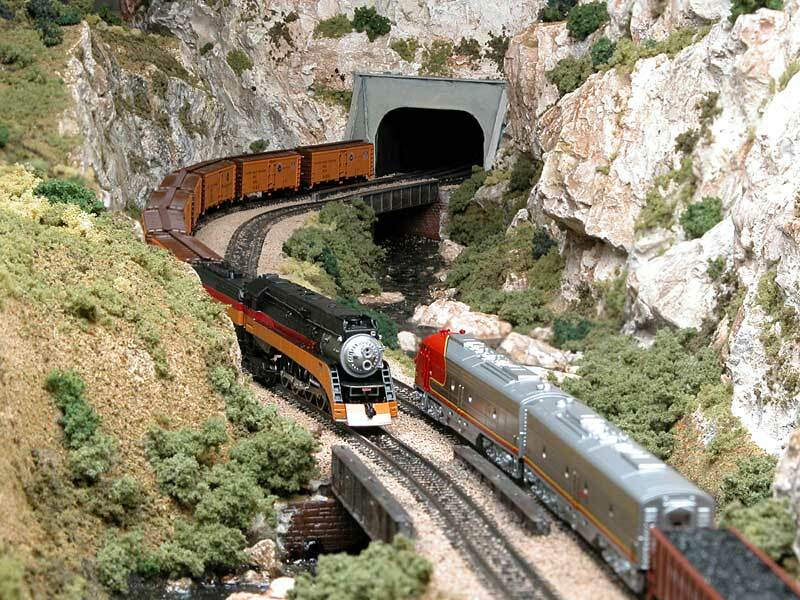 Both models are from AZL. The river start to get the finished shape. 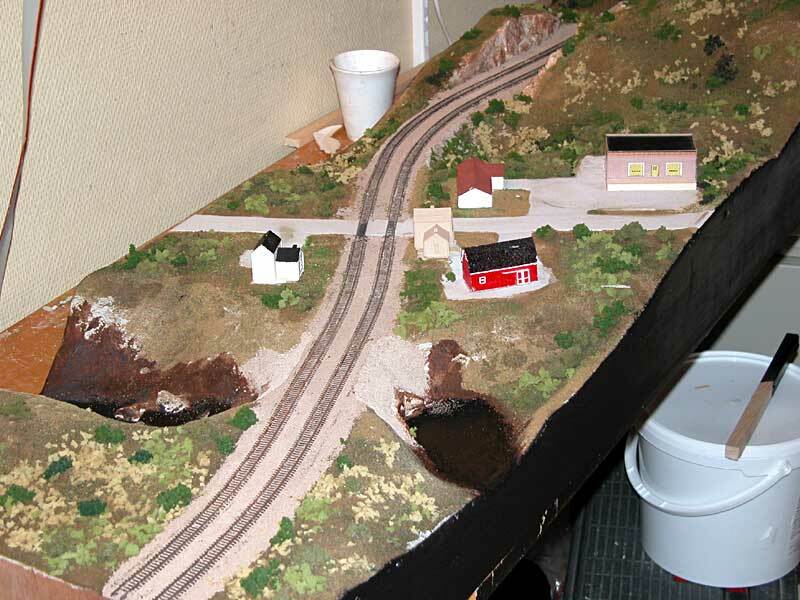 One section is near finish, on the other part the river still need to dry. A lot of bushes and ground foliages have been added the last days. A lot of more detailing shall be done, but it is slowly a progress on the module. Tonight both sections are prepared to install water in the river. 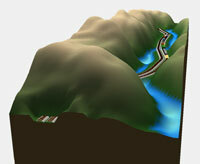 One section has got the first layer of water in the river, and it begin to be a real scene. Both sections are now close to finish status. 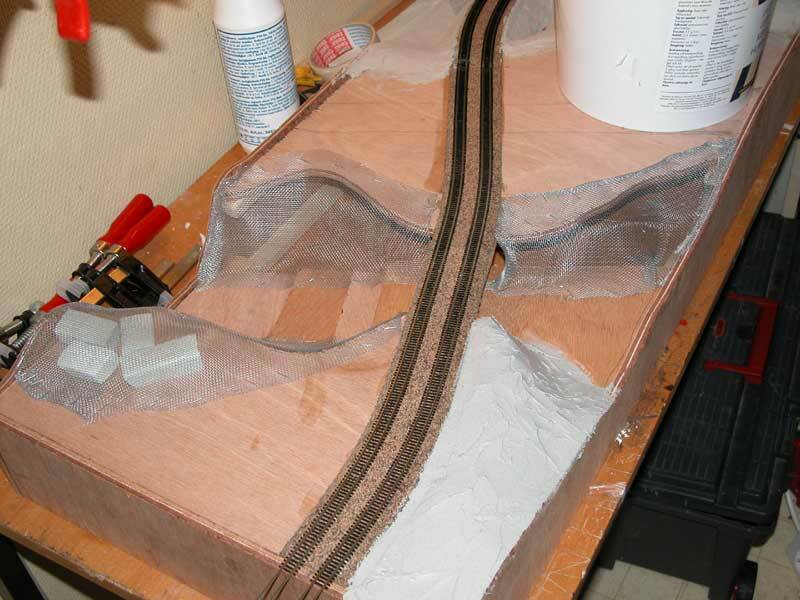 Tonight the ballasting of the tracks are finished and next step will be the riverbanks and to paint the riverbed with a dark color before the water can be finished. 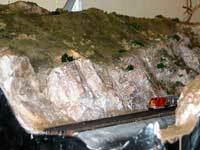 The landscape on one section has come closer to finished status. Still mor bushes to add, but the overall feeling begins to look good. Now the rocks have got some more colors, some black wash and some white highlighting. 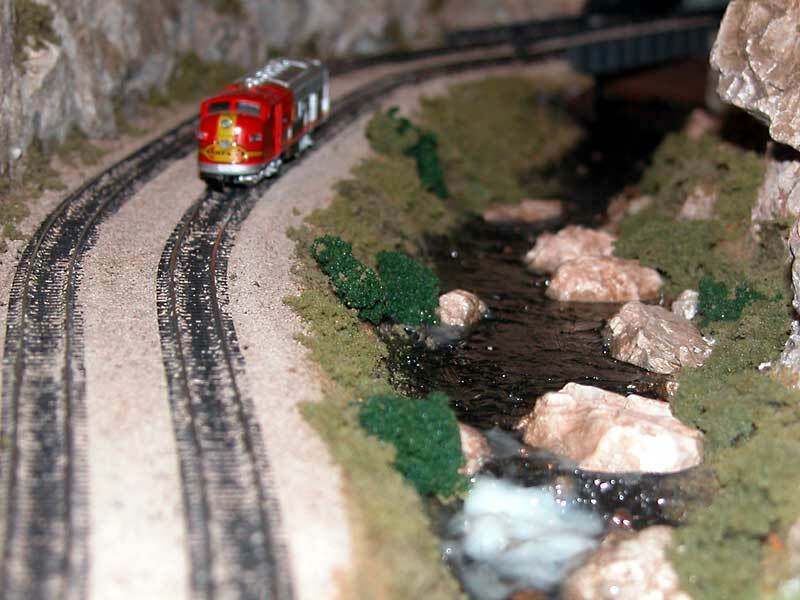 The trackbed and river are still not done. The surface is still wet after the glue/water solution, so the colors will change a little when all are dry in some hours. That can specially be seen on the right picture. The first layer of landscape cover have been installed tonight. Still more to do about the color, its to little variance in it at the moment, so when the paint is dry, more different colors will be applied. 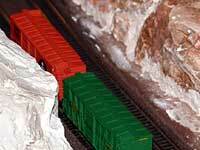 The blending into the rock will also be better. 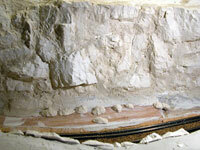 Both sections are at the same stage, as seen in the right picture. On the top left part on the right section, the colors are better. 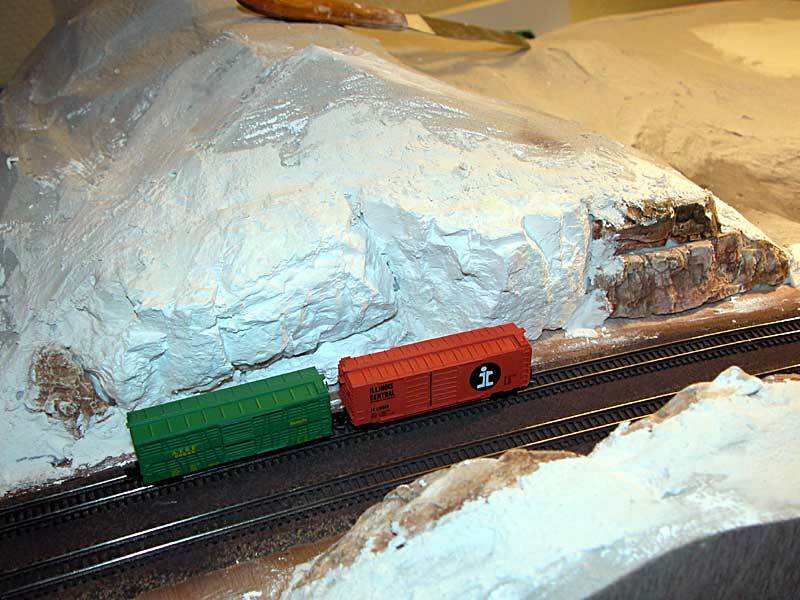 The bridges have been finished, all rockpieces have been blended together with plaster, all tracks have been painted and the first coloring of the rocks have taken place on both sections of the module. 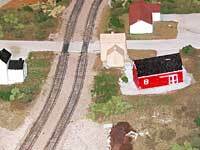 Even a small part of the section in the right picture has been colored on the flat areas. 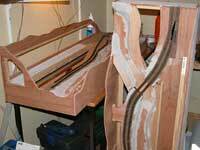 A lot of work have been done the last couple of days and I look forward to finish it even more. Some more coloring need to be done. I have only used 2 colors until now Raw Umber og Burnt Umber. A black wash and some white drybrush shall be done, to have an even better result. I really like to use plaster as a base, because the colors you get, is very nice, compared to paint an opaque layer with paint. 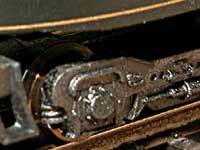 A wash with water and a little color, do the job, and the colors look transparent. 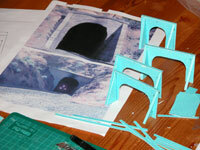 The work to finish the portals have been done and one of the bridges are under construction. 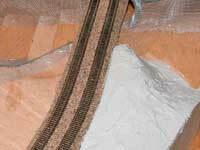 The plategirder bridge is created using 4 length's of N-scale plate girder beams. 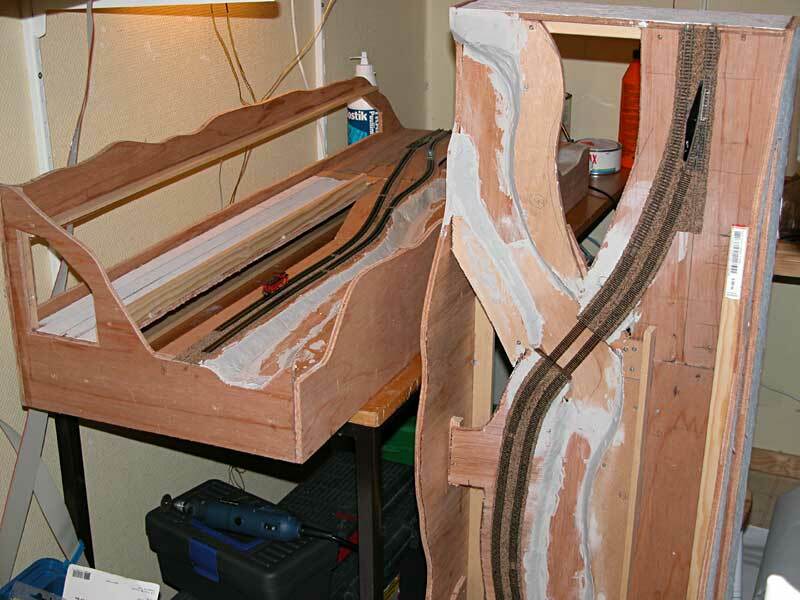 More work is still to be done, but hopefully the finished result will be good. In the background on the left picture: The beams for the other bridge. 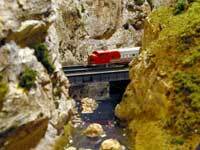 The Märklin F7 is doing the first testrun. Tonight have the portals been installed and missing rockpieces are glued on. Only the 2 single portals are not finished yet. The portals have been painted flat black and will be given concrete color later. 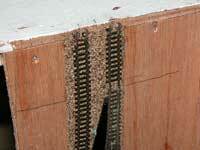 Left picture shows one end of the module. In the right picture the bridge is not installed yet, but the portal is in place. Tonight I have been working on the tunnelportals, a total of 2 singletrack and 3 double track portals, all made of cardboard. 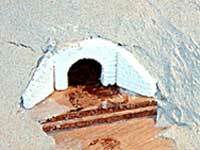 I have used the same design as for one of the portals on Tunnel 10 in Tehachapi Loop. A picture can be seen. Some more work need to be done before they can be installed on the module and the rockwork can be finished after blending in the portals. Finally some more have been done on the module. 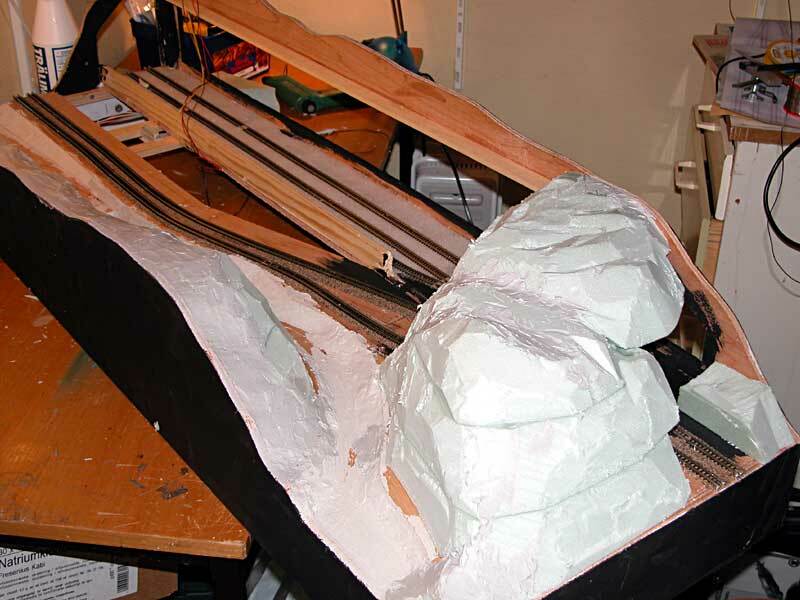 After months with no action, I have finally started to mold rockpieces, glue them onto the module and blend the different pieces together using plaster. 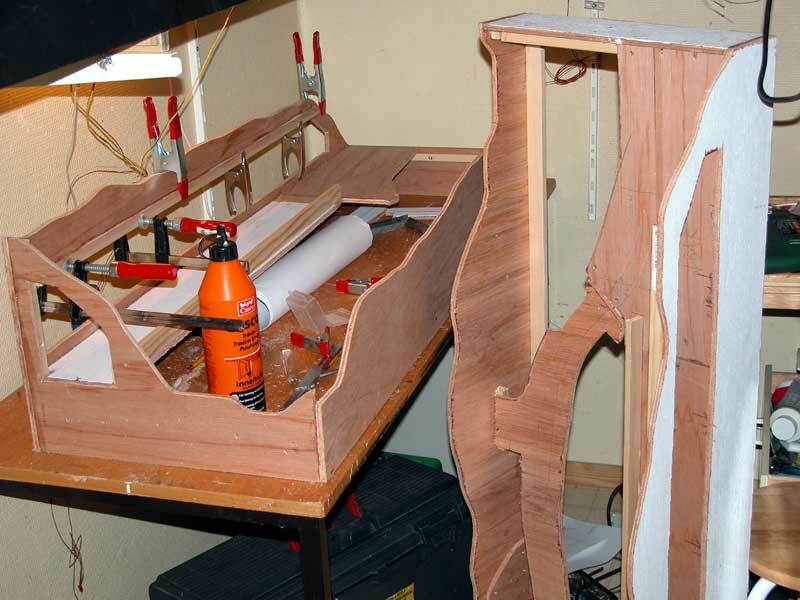 Now all pieces are clued onto the module and half of one section is finished. I love to use this pieces, it's fast and they give the best result with little work. 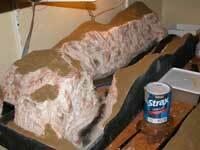 The structures in the finished rocks are very natural, which is more difficult to have if you carve the structure directly into the plaster. For the first time ever, the ZMOD modules have been on the road this spring. 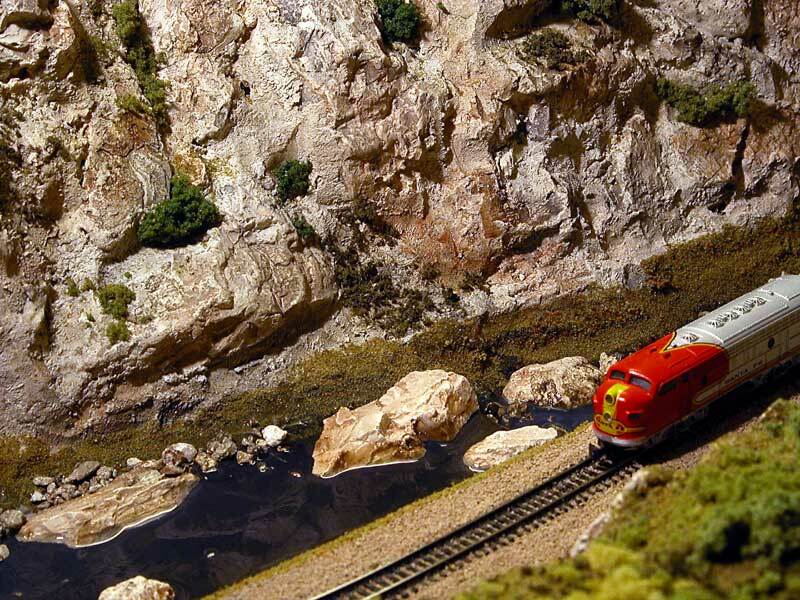 In the weekend the module has been out on the road, in the show held by the Norwegian Model Railroad Assosiation(www.mjf.no) on saturday and sunday. Tor-Jørgen Moskaug and myself, connected together our modules and run a lot of traffic, both Casey Jones, GS4 Daylight and a coaltrain with F7 ABA and a lenght for over 10 feet. My modules did not have a finished landscape, but Tor-Jørgen's was finished. See more at the zmod site: www.zmod.no. Stay tuned for a video from the action, available soon. Pictura at right: 10 feet with action, F7 ABA coaltrain. Casey Jones in action on Tor-Jørgen's module. Tor-Jørgen at right and Svein-Martin at left, behind Tor-Jørgen's module, very satisfied with the weekend. A lot of action with Casey Jones and the AZL GS4 Daylight. More pictures by Tor-Jørgen can be found here. Tonight I have build the legs for the module, so its very close to be able to connect the module with other modules. I have also near finished the baselayer of landscaping on one of the sections. Over the station I used screenwire covered with one layer of gasplaster. 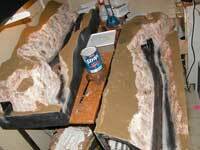 On top of that I can glue the moldings of rock and another thin layer of plaster to finish the landcscapebase. 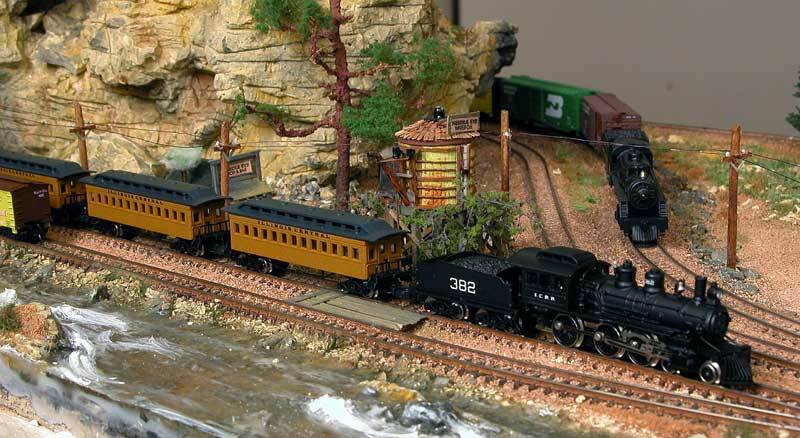 The F7 with 3 coalhoppers can be seen in the rivervalley. 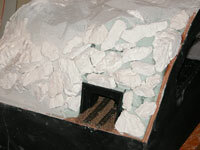 Tonight the first styrofoam were installed to create the landscape on the module. I will use a combination of styrofoam and screenwire. 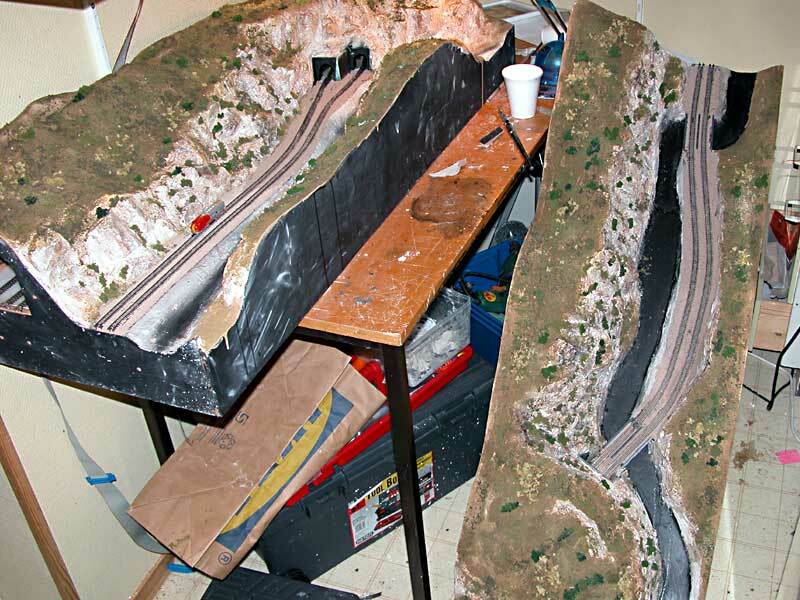 On the right picture you can see the riverbed at the left side of the track, and also the rockwall made by storyfoam. The wall shall be covered with platsercastings of rock, to create a natural look. 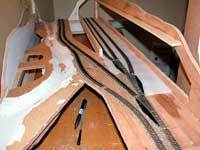 Now all tracks are installed, only the alignment between the 2 section need to be done on the hidden station. Wiring is not finished yet. 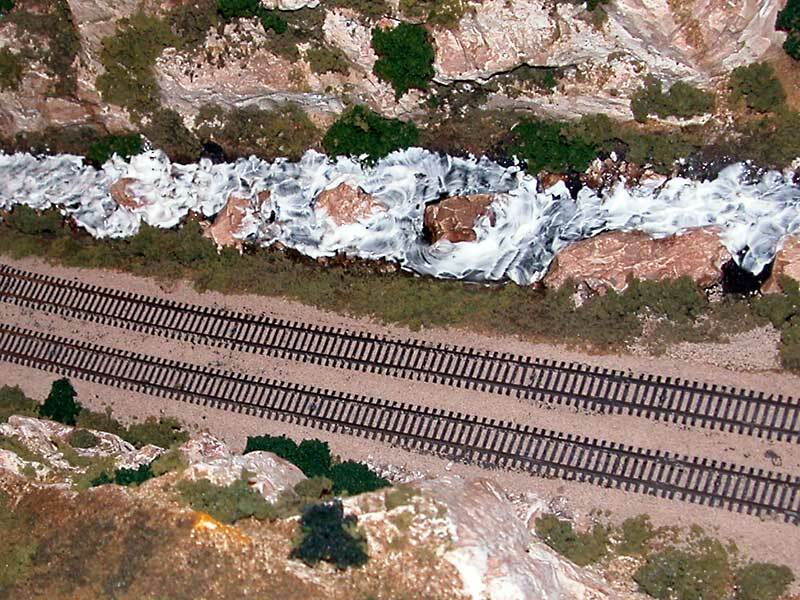 Very soon now can the painting of tracks start and also the creation of the landscape. 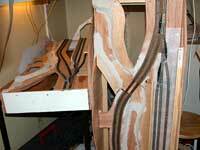 The maintracks have been finished tonight and the necesarry wiring to test the track are installed. 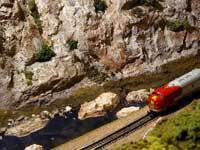 See one minute of action for the first time on my new zmod-module, where the AZL GS4 and a Märklin F7 A-B are running on the tracks. 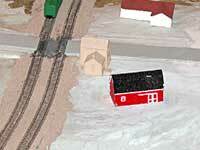 The tracks on the station and all the landscape are still missing. 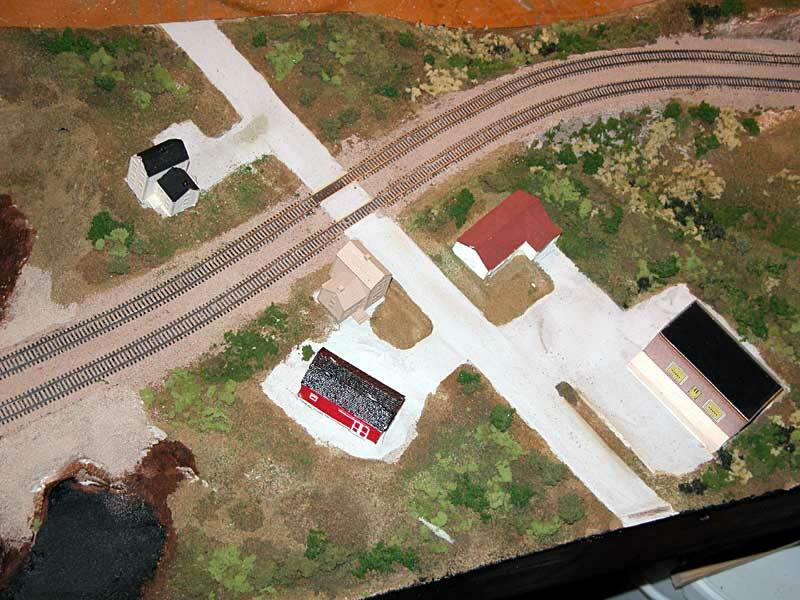 Next step is to paint the track and continue the work. 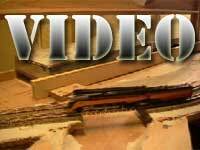 Watch the video here; you need Windows Media Player to run it: Run the VIDEO. 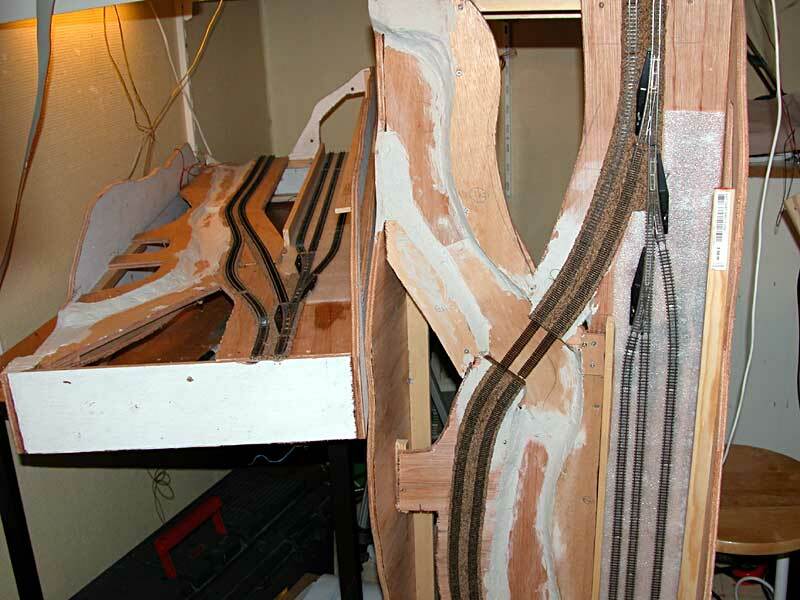 The maintracks are now very near finish, the only missing part now is the connection between the two sections. 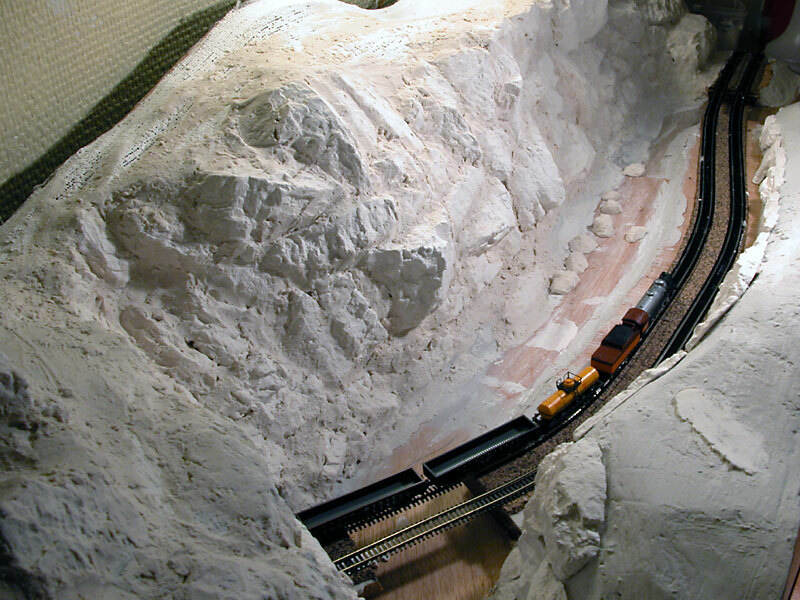 Today the tracks are aligned at both ends, ready to be connected to another modules. Screws have been installed and the tracks have been soldered to the screws so they will be hold in correct position, see the right picture. 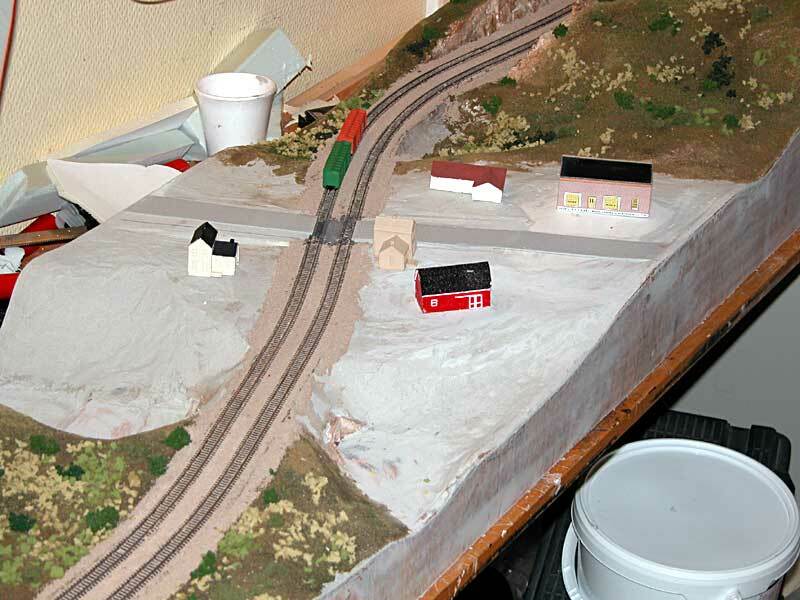 The rivervalley are also plastered today, so the landcsape is started to get in shape. 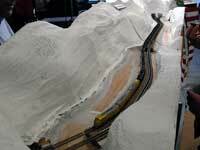 All tracks for the hidden station need to be installed, before the girders for the landscape will be installed. 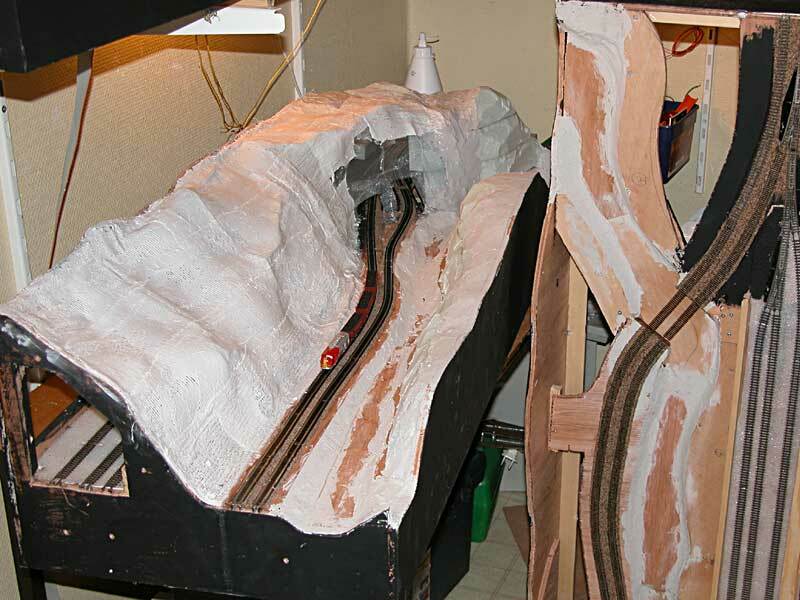 The last weeks have the progress been slow, but now both sections plywood base are finished and tracks are under installation. 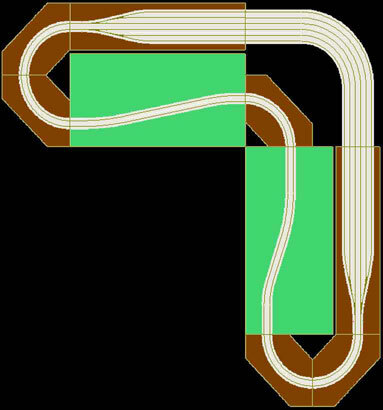 There has also been a small design-change on the trackplan, to make the scene a little more interesting. Below, on the left side of the layout, the 2 paralell maintrack are widened just before entering the tunnel, to create 2 single tunnels instead of a doubletrack tunnel entrance. This will give a more interesting scene. More pictures from the module will shortly follow. The second section of the module is already come a long way. 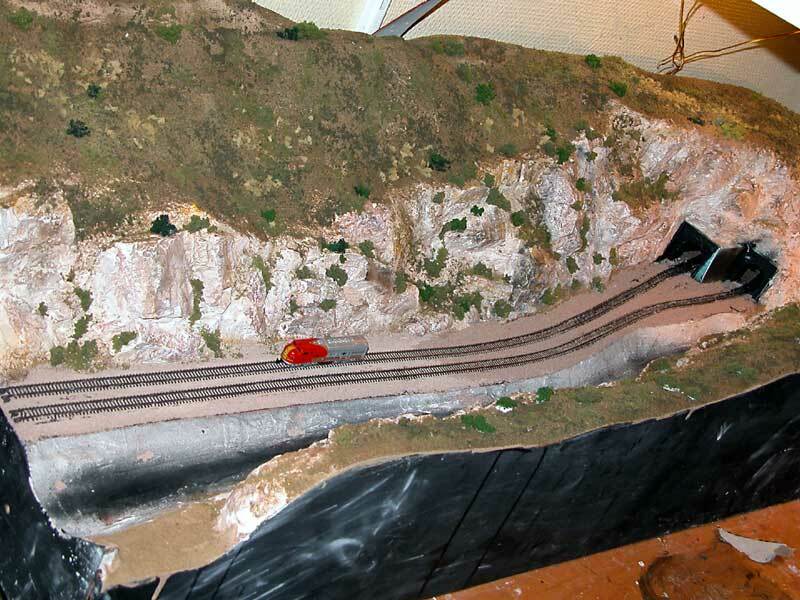 On the right in the picture, the first section with roadbed installed, can be seen. 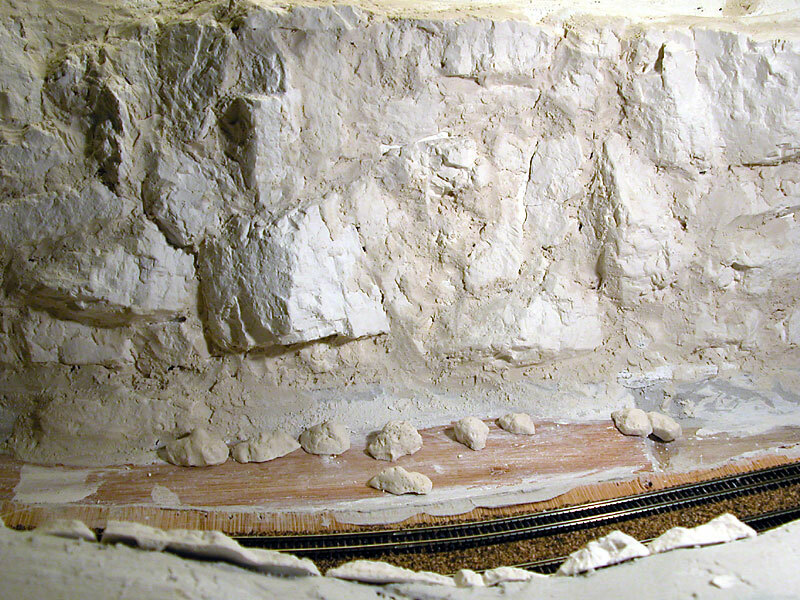 On the second section, the complete roadbed is still missing. The whole construction is very light, and it will be easy to handle the whole module by one person. The building of the first Zmod-modules has finally started, after a long time of planning, and many different configurations. 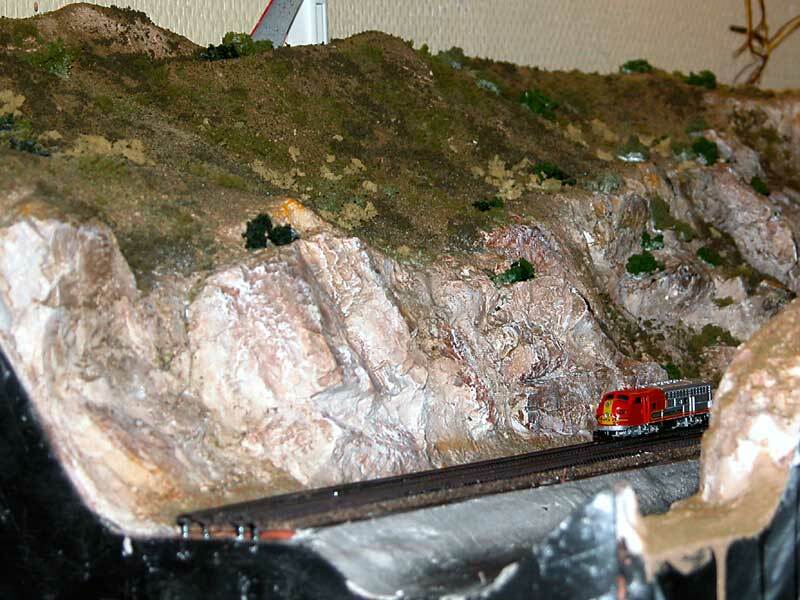 This module, will be a stright module, length 240cm, with the Zmod-double track visible in a rivervalley, with some great rocks and with a hidden 3-track station, connected to one of the main tracks. 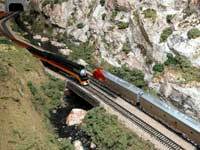 It will give me the possibility under operation, to set up new trains, without interupting the traffic on the maintrack. 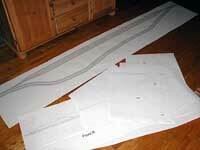 The length of the hidden tracks is up to 180cm, which let me setup some long trains, ready for action. 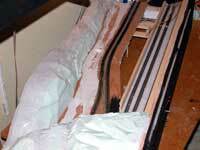 The module is 240cm long, divided in 2 equal length's, for easier transportation and handling. The picture at top, left, the drawings in scale 1:1 is layd out on the floor, and the right picture shows one of the sections. On bottom right, the drawing created from 3rd PlanIt, shows the crossections and the complete length profile of the 2 frontboards. 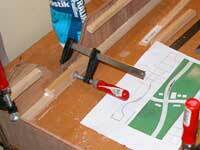 The drawing is plotted in 1:1 and used directly to cut the plywood with correct geometry. A new variant of the modules from 03.02 is created, this time with both tracks visible in the valley, and a hidden station connected to one of the tracks. Even more action with this configuration. Good on shows. 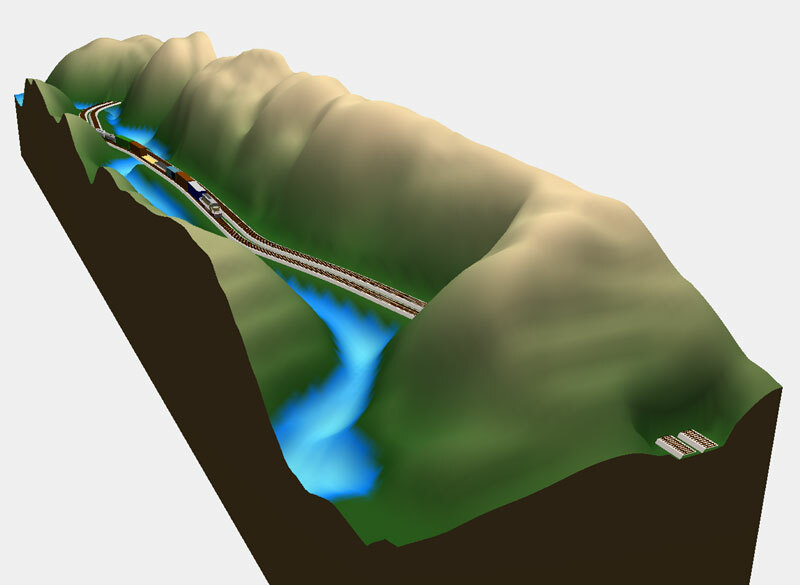 See the 3D view of the layout: The valley with the river and doubletrack action. 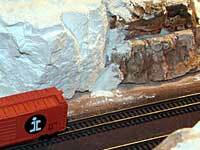 Can you hear the rumbling between the rockwalls? 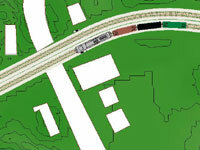 Another new Zmod based modul-layout plan has been developed. I love the planning stage, were I can sit and dream. Here is a modul with a deep valley with a river, one track is visible, the other is covered by the mountains, and have a hidden station. It may be build? 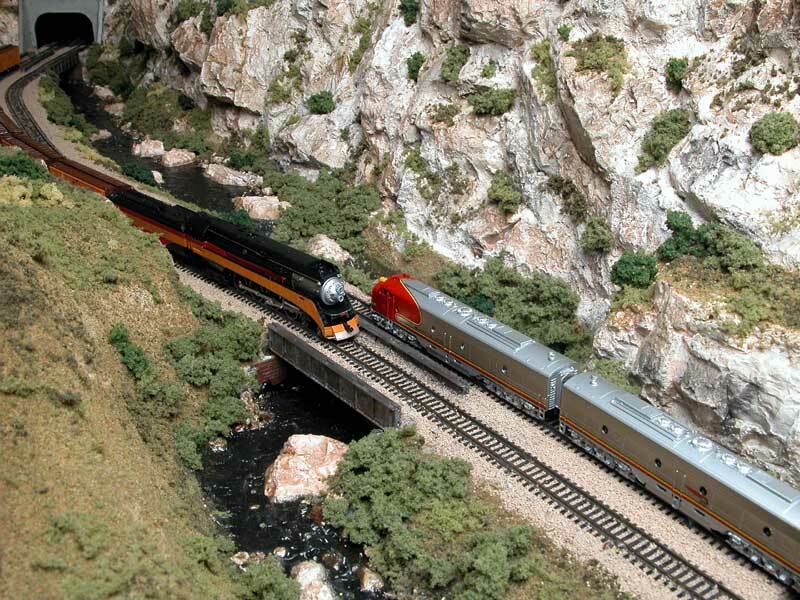 Another dream is a modul from the westcoast of USA, the SP's Coast Division, where I can run my orange SP Daylight Express and my passengers can look out on the waves on the ocean beside the track. 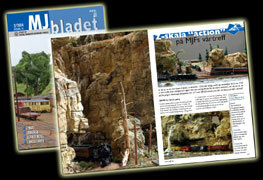 Today I received the March 2004 issue of MR, with some Z-scale scenes, just like what I have in my mind. Great!! 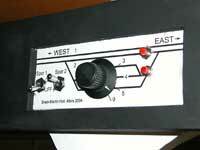 A new Zmod based modul-layout plan has been developed. The old plans from 11.11.02 are gone and may never be build. 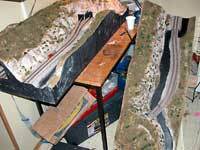 The new layout will be a simple layout with very few tracks and a lot of landscape. 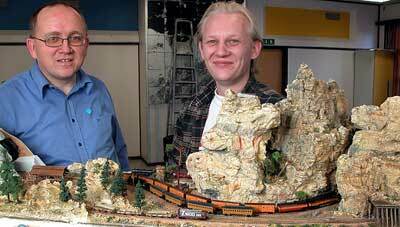 Good for running trains at shows. 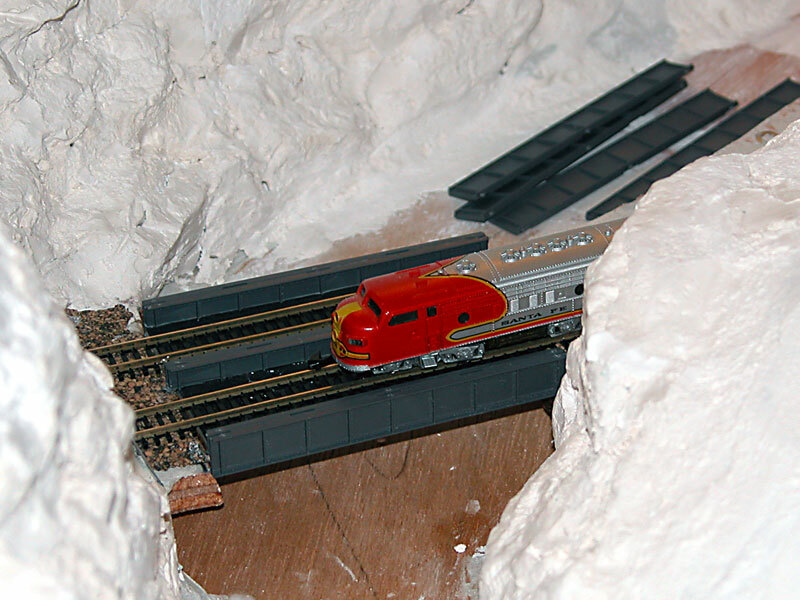 A hidden station under the mainpart gives some more flexibility. In both ends, more Zmod-modules can be attached. More details will be added later on the drawing, or the building will start soon. 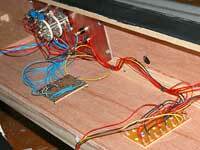 When the modules are in my house, they will be installed below the mainlayout. 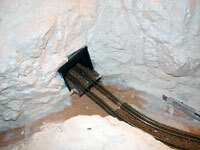 The left endmodule, will be located in the closet, below the helix on the mainlayout. 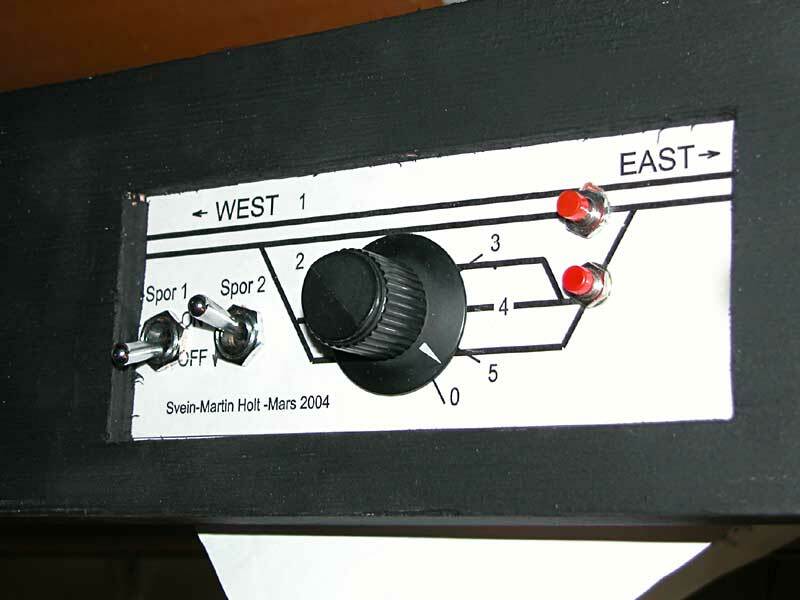 The two layouts will not be connected together and will work as two separat systems. 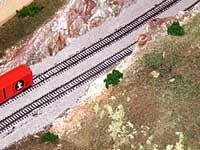 Block control will be installed, so more than one train can run automatically. 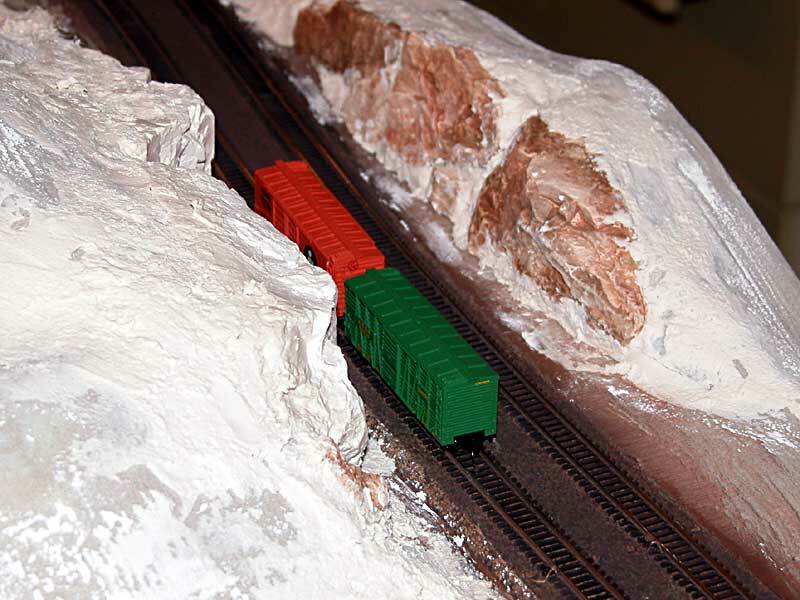 The scenery will include a ranch, a mine and a few bridges. The landscape will be dry american desert, with much brown colors. There will be 2 tunnels, one to hide the turnouts and the track to the hidden station, and the other to give the possibility to create a miningarea on the upper right corner of the layout. All major tracks will be on level 0, the hidden station will be just below. The modules will be build as light as possible, for easy transport. There will be no backdrops on shows, so the layout can be viewed from both sides. 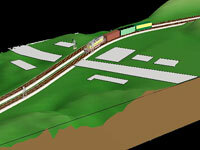 Hopefully some more modules will be build by other Zmod-modellers, so the tracklength can be expanded. 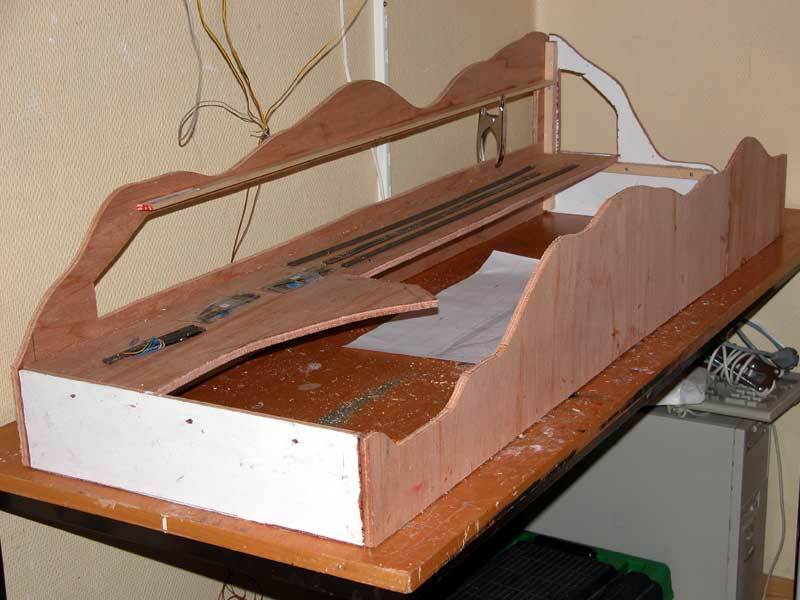 At this stage I would like to have 2 modules, each 90 cm in length, with Zmod interface in the end, so it will form a 180 cm long modul, with zmod configuration. 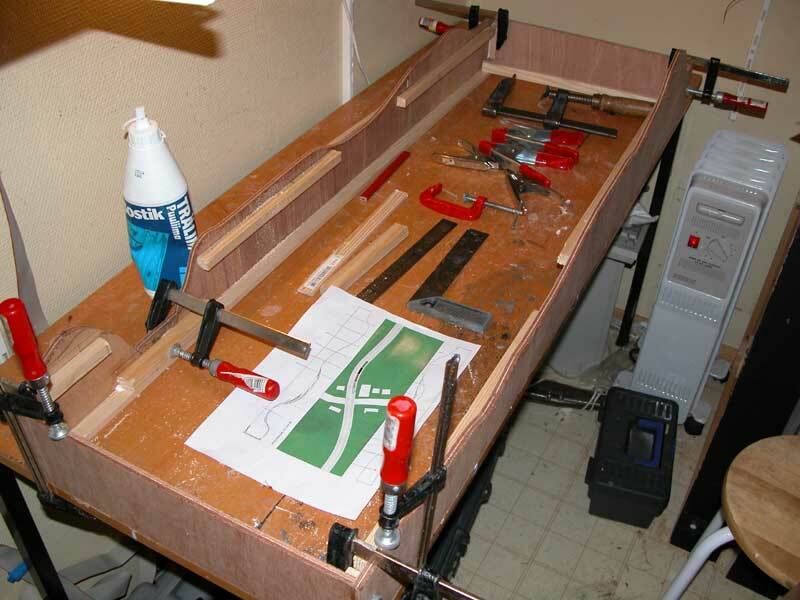 In the time between shows, I would like to set it up in the same room as my mainlayout. 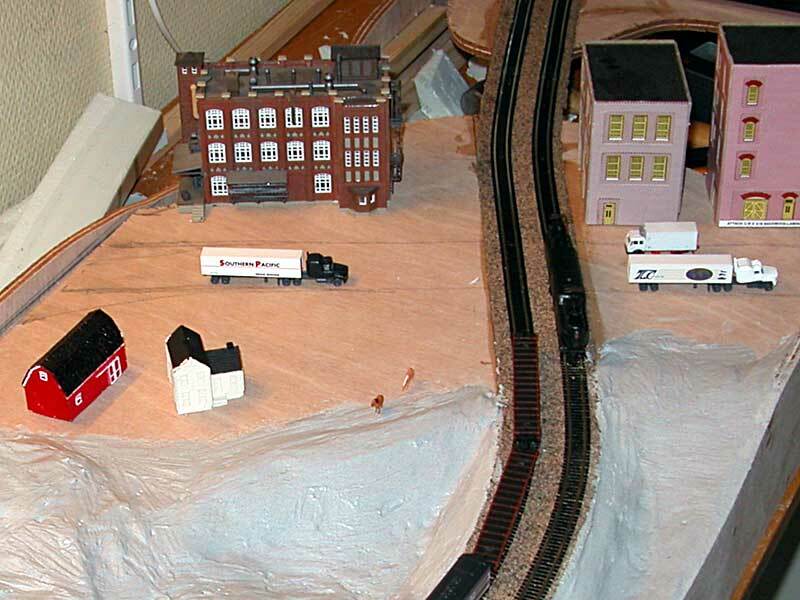 The complete modul layout can also be set up as a circular layout on shows. 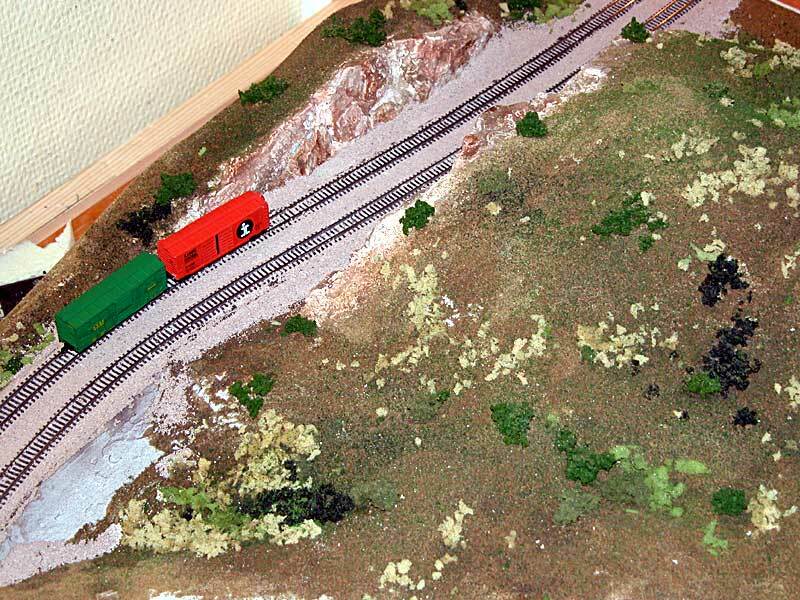 The modules also have some cornermodules and a station, hidden from normal view(The brown area). 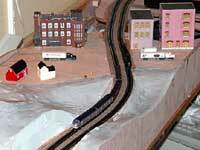 With automatic traincontrol, a lot of different trains can be run on shows. 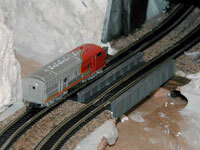 Its also easy to expand with more modules from other modellers. The configuration on shows. This can easy be expanded. 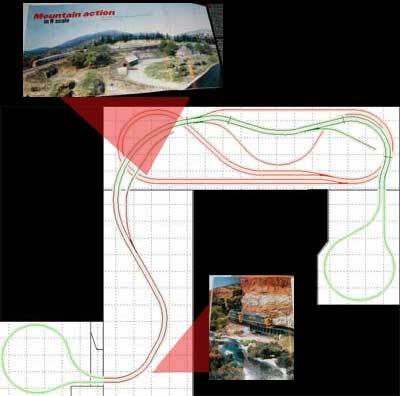 The configuration used with the main layout, at home.